World Series - TECO-Westinghouse Motors (Canada) Inc.
World Series™ Motors are the latest evolutionary step in TECO-Westinghouse AC motor technology. This top-quality line of induction motors is distinguished by high efficiencies, advanced software design capabilities, metric frame sizes and TECO-Westinghouse’s reputation for quality and reliability. Integrating the best of new motor technologies, such as computer-aided design and advanced materials, with the best of proven technologies, including rugged copper rotor construction, Thermalastic epoxy insulation and strong fabricated frames. This unique blend of new and traditional features makes World Series™ Motors the optimal choice for heavy industry applications anywhere in the world. World Series™ motors can also be built to meet many specialty applications including VFD operation, CSA Class I – Division 2 hazardous locations and API541/547 standards. World Series™ Motors incorporate the latest advances in insulation materials. Superior insulating materials allow increased use of copper in the electrical circuit, which enhances operating efficiency. World Series™ motors use box frame construction to provide frames that have the mechanical strength and stability to assure years of dependable, economical performance. TECO-Westinghouse induction motor rotors are recognized as the most reliable in the industry, and their high performance standards are a hallmark of the World Series™ motors. Thermalastic is a proprietary, integrated insulation system that impregnates the wound and connected stator with a solventless epoxy resin. Developed by Westinghouse over 40 years ago, Thermalastic is acknowledged as the industry’s premier insulation system and is under continuous development to maintain its position as the world’s finest. World Series™ motors feature main lead terminal boxes constructed of 12-guage steel, gasketed for air-tight, dust-free and weatherproof protection of terminal leads. Available options include lightning arresters, surge capacitors, current transformers, special grounding devices, cable or bus bar terminations, and top or bottom lead entry. The bearing system used in World Series™ motors has been designed and engineered in cooperation with Renk for continuous, reliable performance and easy maintenance. Both anti-friction and split-sleeve bearings are offered. Our split-sleeve bearings are spherically seated and self aligning, thus easy to service in all field conditions. 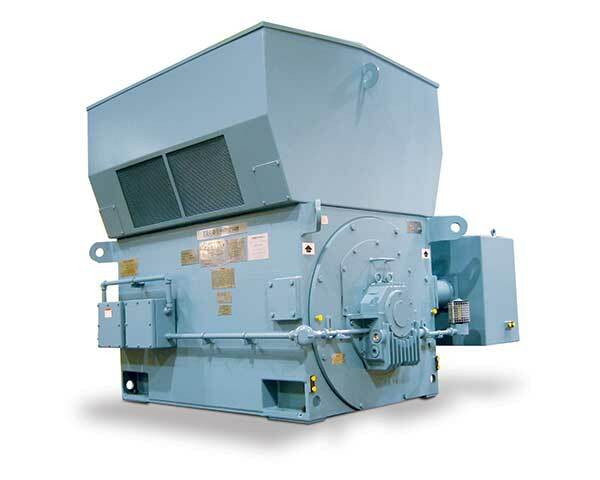 World Series™ motors are offered in a complete range of NEMA and IEC enclosures to meet the toughest demands of industry. Quality is emphasized at each step as a motor proceeds through each stage of design, assembly and testing. Each motor is given a routine test as required by IEC 60034 or NEMA MG 1 to determine that it is free from electrical or mechanical defects. Additional special tests beyond the routine test are available on request. Tests may be witnessed if required.